I have been so excited for this giveaway. In fact I am so thrilled about these products that I personally contacted Two Little Hands Productions to see if they would be willing to provide their incredible work to a lucky reader! They agreed, and you can enter the giveaway at the bottom by commenting. The Signing Time series has been a huge hit in our home and my preschool classroom. When I found out that there was a preschool series in the making, I was over the moon. If you haven’t heard of it already, it is called Rachel and the TreeSchoolers. There are three different DVDs available: A Rainy Day, Plants and Flowers, Incredible Insects. From the first time my own kids saw this, they have been begging to keep watching it. That’s a such a good feeling for me as a mom and a teacher. As a mom I consider these DVDs to be “guilt free” TV for my kids. There are days as parents that we just need a half hour, whether it’s to cook dinner, get ready in the morning, do some cleaning, enjoy a latte and read a couple chapters in a book, etc. These DVDs are in my “bag of tricks” when I need one of these moments. I love that I don’t have to ever worry about what might pop up on the screen while my kids are watching. I have had to screen so many television shows lately because children’s programming definitely contains less than desireable content nowadays…even if it’s just a child who whines through the entire show. Every time I have watched any of the episodes from Signing Time and Rachel and the TreeSchoolers, I am more than thrilled that it doesn’t have anything that I would not be comfortable with my children seeing…plus it’s teaching my children at the same time. As a parent, I even enjoy watching the work of Two Little Hands, and I have learned so much myself. As a teacher I give a “two thumbs up” approval for the Rachel and the TreeSchoolers series. It seems that so many educational programs have the “good vs. evil” theme going, and I am definitely not a fan of those. Why can’t children just learn and enjoy the entire show?! Well thanks to Rachel and the TreeSchoolers, there is another wonderful option out there. I love how they beautifully combine music, signing, games, animation, as well as real pictures of nature. These are definitely an appropriate and educational visual supplement to a classroom during a weather, planting, or insect theme. I want to make this giveaway easy for you!!!! It ends Monday, December 2nd at 10:00 p.m. This giveaway has ended. Check back from more later. 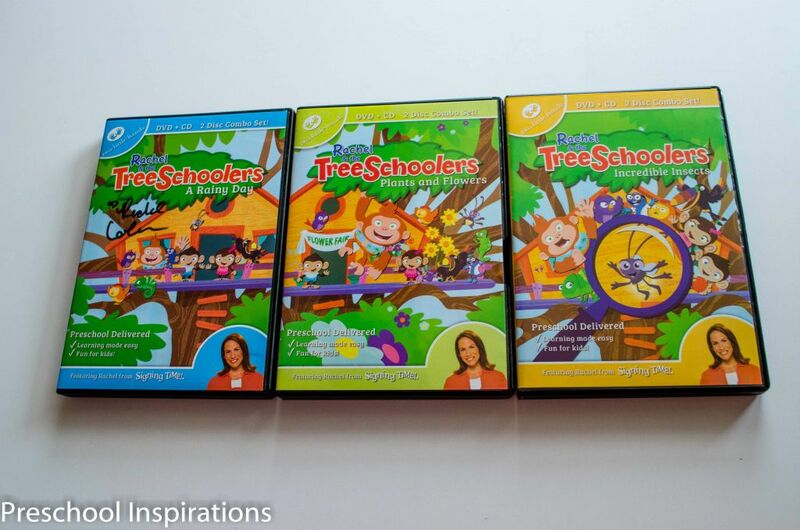 Two Little Hands productions is offering one of you the chance to win a set of the three released episodes of Rachel and the TreeSchoolers. To enter the giveaway, just leave a comment below. You do not have to register! Just choose the option to register as a guest when prompted. This is open to US residents only. The photo of the set above has an autographed copy, which is my personal set. I want to clarify that the DVDs for this giveaway do not include an autograph. We love baby signing time!! This is so cool. I had never heard of these before. The kids love to sing and listen to music, so I love that there are songs in there too. I would love to have a chance to win this set of DVD’s for my youngest, I think he would really like them!! Pick me! Signing time is so fun! My daughter loves them. I am thrilled to learn of these videos! I would love to win them and incorporate them into my homeschool! I did a little bit of sign language with my daughter when she was younger, but this looks like an awesome concept that both my kids would enjoy! I’ve never heard of them but they sound perfect for my son! I love the signing time dvds!! This looks awesome, my preschooler would love it! We loved baby signing times and sometimes I still sing the songs from it! These would be great for my preschooler who likes the TV a little too much, but seems to learn better from the TV than from me! He learned all his letters and sounds from Leapfrog! Would love to have some more educational videos for him to watch! Thanks for the great giveaway! That preview was so cute! My toddlers would love this! We love Rachel and Signing Time. This would be great to win. 🙂 Thank you! We would love to own or work with Signing Times! Yay, we love Signing Time & Baby Signing Time! How neat! I had never heard of this before, but I’m sure my son would love it! I have been looking into this & love it! Thanks for this opportunity to win! I would love to enter this. I have a daughter with some speech issues, and this might help her to communicate more easily. We love Baby Signing time and will have to check out the treeschoolers. Katie! So glad I got to see you tonight at church! These DVDs look pretty awesome. Thanks for putting this info out there! We love Signing Time! It helped my ASD kiddo have a way to talk to us since she wasn’t verbal until 3. Treeschoolers look awesome! Another awesome giveaway on your awesome blog!!!! This is great Katie! Looks like a lot of fun for the kids! Oh, I can’t wait to start signing time with my little one. Would love to win!